Dr. Mel Borins, Toronto, On. We really enjoyed the tour of Bali and we were glad that we could do it with Dr. (Mel & Bonnie) Borins who showed us the real Bali and not the tourist angle. Every moment was an experience of it’s own. Thank you so much for organizing such a unique experience"
...the most magical, and mythical, of all the charismatic archipelago of Indonesia. 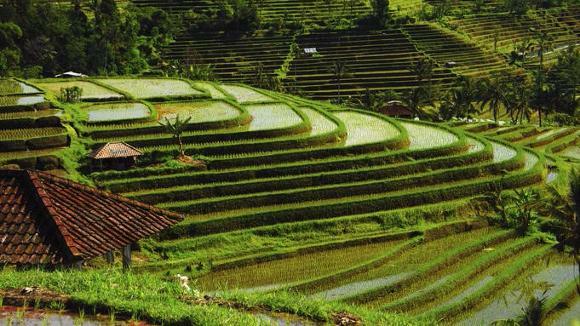 Breathtaking panoramas of cultivated rice terraces, impressive volcanoes and pristine beaches. Some call it the ‘Island of the Gods’ - a truly beautiful tropical island inhabited by a remarkably artistic and spiritual people who have created a dynamic society with unique arts and ceremonies. Our island adventure will take you to Ubud, the heart of Bali’s arts, dance & music; Candi Dasa on the spectacular East coast with its lofty mountains, curving bays & crystalline waters; Mengwi with it’s wonderful views and rural life; Pemuteran and Menjangan Island, an amazing snorkeling and beach experience; and Sanur, a mature beachfront town. Embark on a cultural immersion as you meet with traditional Balinese healers, enjoy private meetings with royal families, explore sacred temples and experience colorful ceremonies. Bali has enchanted visitors for centuries – let it cast it’s spell over you as we take you on an educational journey that you will never forget….. Although we suggest using our online registration form above, if you wish to complete our pdf form instead, please download, print and complete the registration form below from the link below. This form should then be returned by mail, fax or e-mail (scan) to the contact co-ordinates on the form. Our recommended RBC Travel Insurance can be purchased when as part of your registration above. However, for Canadian clients residing outside of Ontario, you should click on the RBC Insurance button below to purchase travel insurance. Doctors-on-Tour. Copyright ®2019. All rights reserved. The programs & itineraries as stated in this website are unique & prepared exclusively for Doctors-on-Tour.